When playing online slots, the hardest task is deciding on which game to play, thanks to a never-ending list of slot machines on offer. Over at Casino Cruise, there are a great deal to choose from, including many new releases, but one that will certainly leave your wanting more, is the Finn and the Swirly Spin slot machine, which can be played on desktop or mobile devices with no download needed. Unlike tradition slots, Finn and the Swirly Spin slot features no pauline’s, instead you have a uniquely designed creation that will spin the symbols around a stone maze. Any horizontal or vertical line of three or more of the same symbol, will award you with a win. A single row or column can contain more than one win and when a win is found, those symbols will explode before your very eyes, resulting in the remaining symbols shifting around the maze to fill the empty spaces. Once the symbols have come to rest, a win evaluation is done, based on how the 5×5 grid appears. So, what can you expect to get your hands on in this NetEnt slot creation? Wild symbols, free spins, sticky wilds and a plethora of bonuses that can boost your bankroll and leave you on the edge of your seat. Keep your eyes on that key symbol in the centre of the maze, because when the key lands here, you will be awarded plenty of free spins with big winning possibilities. Starfall Wilds: These shiny little stars will appear on two or more spaces on the maze randomly. Dragon Destroy Spin: Nobody likes a losing spin, but you won’t mind about winning nothing when this feature is triggered. This fire-breathing demon will destroy a number of symbol, which will then activate another avalanche – this guarantees a win. Irish Luck: After a losing spin, a horizontal or vertical line of the same symbol is added to the maze, allowing for a guaranteed win. Free Spins: When the key symbol eventually lands in the centre of the maze, you will get to choose your own free spin feature; The Star Bar; 7 free spins with Starfall Wilds feature, Lava Lair; 3 free spins are awarded with the Dragon Destroy feature, Lucky Mug; 4 free spins are activated with the Irish Luck feature and finally, the Golden Pot free spins feature awards 2 free spins with the Magic Transform feature. 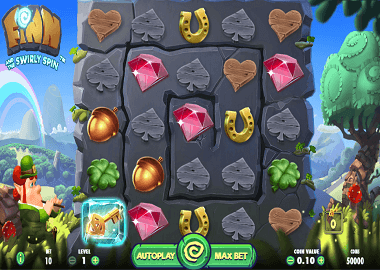 Whilst playing out your free spins, you have the ability to trigger more, just get those keys to land in the centre of the maze again and again, to see the number of your free spins grow. Finn and the Swirly Spin slot machine is fun-filled. It is suited to players with all types of budgets – from low limit stakes of just 10p a spin to high rollers who can afford to splash £100 a spin. There is a non-progressive jackpot of 500x your stake on offer, so whether you decide to bet big or bet small, there’s big cash waiting to be triggered. Join Casino Cruise today and play for free in demo mode, or take advantage of a £1,000 welcome package, which includes 200 free spins on your first deposit.